Want to learn more about The Boomsday Project ? Head on over to our The Boomsday Project guide! Join the discussion on our forums! 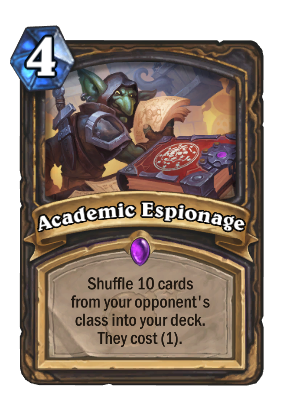 Come discuss Academic Espionage over in our dedicated Academic Espionage discussion topic. Shuffle 10 cards from your opponent's class into your deck. They_cost (1). The tenth Pyroblast really felt like overkill. JUST OP!!!!!!!!!!! the death of each control deck, for only 4 mana you have infinite value, madness! turn 1 prep, turn 2 dk rexxar. how retarded. If wanted to play the lottery, I'd go to the store and buy a ticket. Another "wonderful" blizzard creation. This card should be much weaker. "Hmm... How can I win this game? Ohh I know. Just gonna play some random bs cause I can't think for myself and have no idea how to build a fun deck other than base it on total randomness." If Blizzard wants to print "FUN CARDS" then such should be totally out of competitive level. Warlock used to have a similar card but it was much weaker, Wizzbang gives you a random deck which is also fun but at least the two cards I mentioned don't WRECK fatigue and control decks. Cards shuffled in the deck should have at best their price cut in half and not cost 1. This card is too strong given its randomness. Either card is made to be pure fun and you have 30% WR at best or just make them weaker for god sake so it is not used on the ladder. Get a girlfriend, stop cryin'. The card doesn't insta win the game for u, actually shuffle rogue is low win rate deck now. Learn how to play the game before sayin a lot of poppo online. This is the reason to carry Archbishop Benedictus in your Priest deck. All those delicious 1-cost cards are now yours! I'm scared of dinosaur roars more than ever before now. Skulking Geist destroys the spells, i guess? It totally should, but apparently doesn't. Meta defining 49% wow. For some reason when a rogue use this against me they always get my legendary high cost cards right away. This card is just too good, if fatigue decks were ever a thing they aren't now. Give it a chance. If meta goes more control it could be really good. Certainly wouldn't dust yet. Don't get me wrong, I love the card, and I agree with you. Though, it hasn't lived up to the hype for it before release. Fun, but not competitive unless something drastically changes. Holy smokes, that's a leak!